Street Fight is a 2006 Academy Award nominated documentary that chronicles the 2002 mayoral race in Newark, NJ. It's frightening, eye-opening... at times depressing... and at times inspiring. 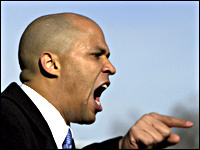 Thank god Cory Booker won the 2006 election and is currently Newark's mayor... Else this would have been impossible to watch.